…in a safe and caring environment. Gospel values reflect the teachings of Jesus Christ, as outlined in the first four books of the New Testament (Matthew, Mark, Luke and John). Gospel values include: respect for the life and dignity of all people; trust in God; honesty; forgiveness; mercy; community; service to others; equality; simplicity; and peace. Catholic Virtues are celebrated monthly in York Catholic schools, through our York Catholic Communities of Faith: Virtue of the Month tradition. Our Catholic Virtues include: unity; wisdom; perseverance; reverence; responsibility; integrity; courage; compassion; justice; and hope. We believe that these Gospel Values and Catholic Virtues guide our work and interactions with all stakeholders on a daily basis. Relationships are built primarily by what is shared and what is developed together. We must remember that we are all part of the People of God, of the Body of Christ, of the communion of the Church. Both parish and school act in a secondary role seeking to nurture and strengthen, rather than supplant, what has already begun and is occurring within the Christian home. In the province of Ontario, we are blessed with the gift of the Catholic school system. It is the Board’s vision that parents, teachers, and pastors work together to provide a strong faith foundation for the children entrusted to our care, helping them to come to an understanding of God’s love for them, and God’s desire to be one with them on their journey of life. Faith development plays an important role in our classrooms, and we are committed to working with home and church to engage our students in prayer, liturgy, and the Sacraments. We teach and inspire all students to achieve their God-given potential. Guided by the Ontario Catholic School Graduate Expectations and the Ontario Catholic Curriculum Policy Document for Religious Education, our students learn, grow and seek to transform the world through faith, hope, love and service by: Believing, Celebrating our Faith, Living a Moral Life, Living in Communion, Living in Solidarity and Praying. 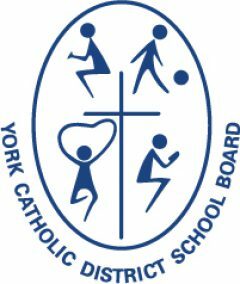 We are very proud that the York Catholic District School Board is one of the top-performing school boards in the province. This spring, the Ministry of Education published individual school board graduation rates across Ontario, and the York Catholic District School Board achieved the highest graduation rate of all English language school boards in the province. Developing 21st century learning and life skills. The York Catholic District School Board believes that safe, caring and inclusive Catholic schools and school communities are fundamental for creating and maintaining healthy learning and working environments. Our focus is on equity and inclusive education, safe and caring schools, mental health and well-being. The Board’s Code of Conduct governs the behaviour of all members of our learning community, ensuring that all schools are safe, comfortable and accepting learning and teaching environments. Respect for self and others, contributing to the common good, accepting accountability and responsibility for one’s own actions, seeking and granting forgiveness, acting morally and legally as a person formed in the Catholic traditions, and the promotion of self-discipline are cornerstones of this belief. Because of the strong link between mental health and student achievement, the Board recognizes the importance of Mental Health, increasing awareness of the signs of child and youth mental health problems; decreasing stigma; early intervention; and understanding that help is available. The Board has developed a comprehensive mental health strategy and five-year plan for implementation.